Protect Syrian Archaeology has shared damage to Yalbougha al-Nasri Hammam, video and photo by Ismael Abed Alrahmad here and here. 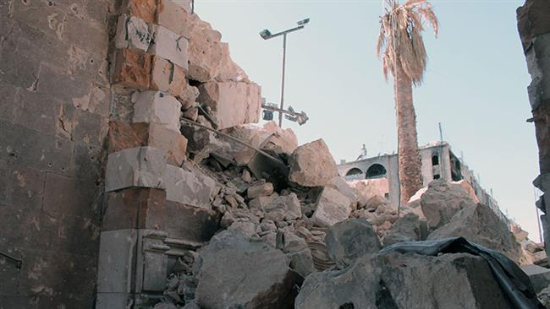 A report showing the damage to the site of Al-Sh’yebyia/Al-Shyebia Mosque, by Shahba Press Agency is posted here. A tunnel bomb in Aleppo has collapsed the eastern exterior wall of the Umayyad mosque, reports the DGAM on January 28, 2015, here. PressTV reports that ‘foreign-sponsored Takfiri militants’ have destroyed the Sheikh Muhammad al-Nabhanin shrine, a Sufi saint. The library of the seminary, attached the shrine, was also ransacked. See the PressTV report here, and confirmation by the DGAM here. AINA reports ISIS militants forced inhabitants of Tel Hormizd, an Assyrian town in Hassaka, Syria, to remove the cross from their church. See the article with photos, here. The DGAM reports on January 21 2015 that illegal excavations have been carried out at Resafa. The city, the Sergiopolis of Roman sources, so-named because it was the primary shrine in the Roman Empire to St. Sergius, is a well-known example of Roman military architecture, and contains three churches as well as a well-preserved cistern complex. Recent damage includes a hole blasted in the western wall to allow vehicles to enter. Positively, the DGAM reports that the local population stood up to the vandals. See the short report here. The DGAM is participating in training being held in Lebanon between the 26th and 30th of January. The training, sponsored by UNESCO, is designed to teach the protection of portable heritage and also the protection of museums. See the full report here. The Council for British Research on the Levant (CBRL) sponsored a seminar on Syrian Heritage in Crisis at the British Academy on January 16. Speakers included Samer Abdel Ghafour (DGAM), Neil Brodie (Glasgow University), Sam Hardy (UCL), Marc Lebeau (Brussels), Graham Philip (Durham), and Peter Stone (Newcastle). The Art Newspaper ran a story headlined ‘No group has put our heritage at risk more than the Islamic State’ by UK MP Robert Jenrick. Illegal antiquities trade is out of control, and international efforts are necessary to stem the tide. Ross Burn’s Monuments of Syria blog provides a concise update on damage here. The January 17, 2015 update provides a 17-page PDF file with detailed information on sites damaged along with sources of information.